New concept of the highly anticipated iPhone XI (11), triple camera and design similar to iPad Pro? In the previous article we talked about some renders showing a supposed design of the highly anticipated iPhone XI (11), well. We also told you that we were listening to other rumors and well, on the net or to be precise on YouTube, we found a new video on the alleged concept of how it could be the new and highly anticipated iPhone XI (11). In this video is shown redesigned with elements similar to the design of the iPad Pro that blend with the previous model of the iPhone series, that is, the iPhone X. In the aforementioned video, an iPhone with USB-C is presented, which then replaces the traditional Lightning door. 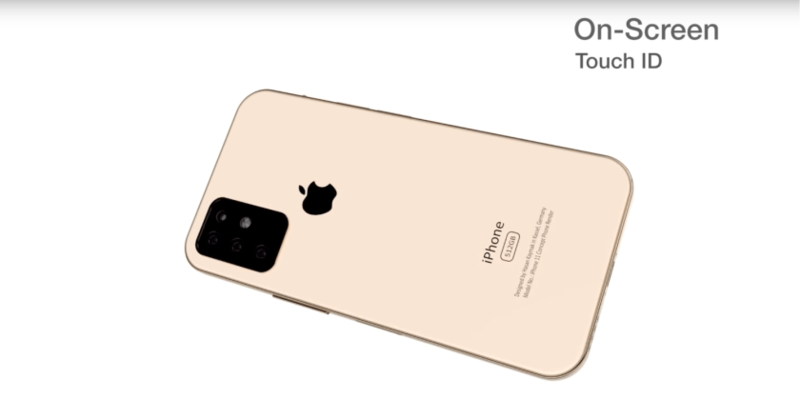 In video, as you can still see, there is a triple camera that, as we say, is present on the back, the video in question for now offers the cleanest implementation, at least with a square design. In addition, a small notch is also displayed where the standard earphone speaker is almost integrated with the stainless steel band around the phone. In the video are also shown some fantasies such as Touch ID on the screen, the technology in question is highly unlikely to return in vogue, considering also that the Face ID of Apple is much safer than Touch ID. In the past the rumors on the iPhone XI (11) have always pointed towards a new configuration with three cameras on the back of the iPhone. Finally, the video shows an iPhone XI (11) with a design that is very reminiscent of the new iPad Pro. ← How will iPhone XI (11) be?